These "testimonials" or references were gathered by William after he left the Royal Artillery and during his time in England when he was applying for various jobs. They are very descriptive and full of the pompous language of the time. I believe William would have highly valued these recommendations about his character and his work ethic. The other detail that these documents provide are that William had applied for a job as Governor at the new Leeds Gaol (opened in 1847 and modelled on Pentonville) and had also been employed at Pentonville Prison as a Trade Instructor from 1843-1847. 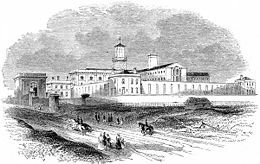 Pentonville Prison is in North London and was hailed as a great new concept when opened in 1842. I beg to present for your perusal Testimonials as to fitness for the Office of Governor of the New Gaol at Leeds. My patrons have left me little to say for myself. I would only observe, that having served twenty one years in the Royal Artillery (more than twenty of which as a Non-commissioned Officer) my habits of discipline and order are therefore stable, but, I trust, with consistent humanity; and having held a responsible place in the Manufacturing Department of this Prison for more than four years, with too, a perfect knowledge of the routine and all its features; together with the varied practical experience of order and discipline now for twenty five years, which I hope, cannot fail being advantageous in the management of your New Prison. Should my testimonial warrant your choice of me, I will most respectfully solicit your vote. The last four testimonials were obtained for that of Master to a very large London Union, but the salary not being sufficient, I did not become a candidate for the office; I hope, however, they will be considered sufficiently expressive for my present position. I certify that WILLIAM BARLOW, of the 6th Battalion Royal Artillery, was a Bombardier in the Company under my command for two years; that he conducted himself during that time much to my satisfaction, and I consider him an active and intelligent noncommissioned officer. Sergeant Wm. BARLOW, of the Royal Artillery, has been in my Company nearly eight years, and since 1828 has been Pay Corporal and Sergeant to it; and in all my services I have never met a better or more talented noncommissioned officer, being at all times most zealous in the discharge of his various duties. He was for a considerable time Regimental Schoolmaster and Clerk to the Military Chapel, and in these capacities gave equal satisfaction. I certify that Sergeant Wm. BARLOW, of the Royal Artillery served under my command at Gibraltar during the whole of the period in which I commanded the Royal Artillery in that garrison from January 1829 to March 1834, and throughout conducted himself to my entire satisfaction as a strictly sober, intelligent, active and zealous noncommissioned officer, being employed as Pay Clerk of Major Grant's Company, and appointed by me Schoolmaster of the Ordnance Corps. I certify that I knew Sergeant Wm. BARLOW, at Gibraltar, from March 1829 to November 1834. I was in the same Company (Major D. Grant's) during the whole period, for the last twenty one months Sergeant Barlow was Schoolmaster Sergeant of the Ordnance School, of which I had the superintendence. I knew him always to be a steady, well conducted non-commissioned officer; and while at the head of the school he conducted it not only to my satisfaction, but also to that of the Chaplain of the Forces (the Rev. I. S. Pering), and also of the Commanding Officer. I certify that I have known Sergeant Wm. BARLOW, of the Royal Artillery, during the last six years; that I have every reason to entertain a very high opinion of his character, as a man of honour, honesty and integrity, and have no doubt whatever of his being a fit person for a place of trust, confidence, and activity: and I have also reason to know, that he possesses information and ability beyond what is found in persons of his station in life. Having known Sergeant WILLIAM BARLOW, of the Royal Artillery, for the last six years I can bear the strongest testimony to his general good conduct; having reason to entertain a very high opinion of his character and abilities, the latter being very far beyond others in the same station of life as himself, I can confidently recommend him as a fit person to fill any situation where integrity and trust are required. I have great pleasure in stating the good opinion I entertain of Mr. WILLIAM BARLOW, as a man of discretion, humanity, and consistent Christian profession. 1 have had abundant opportunities of forming this judgement of his character from personal observation, now for nearly four years, in this institution. He is marked too by habits of discipline and order; and in his disposition, is a lover of peace. As a Master of a Workhouse, therefore, I have no doubt that he would give great satisfaction to any Board of Guardians. He would properly carry out their orders, preserve peace and good will in the house, and thus saving the governing body from that infinity of trouble which ill regulated minds in such cases constantly produce. My brother Chaplain entertains the same opinions, but does not know Mr Barlow so long. Having known Mr. BARLOW since the opening of Pentonville Prison, in 1842, and having had frequent opportunities of observing the praiseworthy manner in which he has not only discharged his duties as Trade Instructor but has used his influence as a moral agent among the prisoners, I have formed the same opinion of him as expressed by the Rev. J. Kingsmill, the Chaplain, and consider him peculiarly fitted for such as situation as that of Master of a Workhouse. Mr. Barlow - I can have no difficulty in giving you the testimonial which I understand to be required upon your present application. I had opportunities of knowing your character and conduct while you were an officer of the Prison at Pentonville, and I was much satisfied with them. I consider you trustworthy and zealous in the discharge of your duty, and feel I can conscientiously recommend you as a fit person to fill the situation of Governor of a Workhouse. Signed I am your friend, DEVON One of the Commissioners for the Government of Pentonville Prison. Sir, During the period of my being a Commissioner of the Model Prison at Pentonville, you held the situation of Trade Instructor, and both from my own observation and the reports of others on whom I can reply, I have every reason to consider you very efficient in your situation, and of the strictest integrity. I also believe that your moral character and conduct will bear the most searching investigation, and I consider you well qualified for the situation of Master of a Workhouse. Sir John Walsham, Poor Law Inspector of the Eastern District, has much satisfaction in recording the high opinion which he has been induced to form of Mr and Mrs Barlow's qualifications for the places of Master and Matron of a large Workhouse , during the period of their management of the Bishop Stortford Workhouse, under his superintendence. Sir John considers Mr. Barlow to be a person of unusual attainments for his sphere in life; and the numerous suggestions for the material improvement of the Bishop Stortford House, and the exertions for the moral improvement of its Inmates, which Mr. Barlow has made during the last twelve months, deserves the highest commendation. Dear Sir, I bear a willing testimony to the efficiency with which every department of the Workhouse has been superintended by yourself and Mrs. Barlow, both as far as it has come under, my own notice while Chaplain, and before that time when I have been a frequent visitor. It may be gratifying to learn that my deceased Father your late Chaplain ever spoke in high terms of yourself and Mrs. Barlow. From the number of years (32) that he had been Vicar of this parish and intimately acquainted with the Poor-house, he was well capable of judging of the comparative merits of those who successively superintended it - and I do not doubt that had he been spared he would gladly have borne his testimony to your superior zeal and judgement. Yours very faithfully, C.C. SPENCER, M.A. Mr Barlow In the course of business we occasionally come into contact with Officers of your description, and we can honestly say we never met with a person so perfectly master of the details required in a Public Establishment, or whose deportment were better adapted to the duties than yourself. SIR, In compliance with your request I, as one of the Guardians of the Bishop Stortford Union, shall most readily sign a testimonial expressive of my opinion that you and your wife have discharged the duties of Master and Matron of the Union Workhouse in a very efficient manner. Mr Barlow, My daily visits as Medical Officer to the Bishops Stortford Union Workhouse, have afforded me ample opportunity for acquainting myself with the economy and general conduct of that establishment both before and since Mr Barlow became Governor, and enable me to bear testimony to the great improvement he has effected in the arrangement of the House and the management of the Inmates. The Drainage which was very bad, has been put on a much better footing; a new system of ventilation has been introduced of a most useful description; the Cooking department has been brought to a state of great efficiency and made available for keeping up a constant supply of hot water to various parts of the building; and means have been provided for carrying out a more effectual separation of the various classes. The youths of both sexes have been employed, the boys taught painting, grazing and spade husbandry, and the elder girls prepared for service; the business of the House appears to me to have been conducted with great order and care. I have known Mr. Barlow for several years during which he has been Governor of the Bishop's Stortford Union House, and am glad to express my opinion of him as a a man of high character. I have always considered him and his wife to be most respectable people, and very anxious to discharge the important duties that devolved upon them with the utmost diligence. I believe they have always treated those who have been placed under their charge with kindness and consideration and that their management has been judicious and careful. I feel confident that Mr Barlow is a man of strict integrity, and that he will conscientiously do his duty in whatever situation he may be placed. I have much pleasure in stating that I have been personally acquainted with Mr and Mrs Barlow for the last two years, during which period I officiated as Assistant Chaplain of the Bishop's Stortford union House. I have always observed the greatest order and regularity in the House, and moreover entertain a very high opinion of them as truly conscientious and pious persons, and have always been gratified with Mr Barlow's zealousness in promoting the moral improvement of the Inmates. The industrial training of the whole Establishment is placed on a most commendable footing. I can also bear testimony to the high esteem in which both Mr. And Mrs. Barlow were held by the late Rev. Charles Spencer, formerly Chaplain, and conclude by stating that Mr. Barlow is a man of considerable experience and ability and that in my opinion two more trustworthy and efficient persons could not be found to fill the offices of Master and Matron for which they are candidates. Signed BASIL J. WOOD B.A. Mr and Mrs Barlow, now Master and Matron of the Bishop's Stortford Union Workhouse. The Bishop's Stortford Union Workhouse has been under Sir John Walsham's Superintendence during the whole period of Mr. and Mrs Barlow's services in it; and they are fully entitled to his testimony to this zeal, ability, and success with which they have conducted the management of a large Establishment. Mr Barlow is one of the most intelligent, educated, and experienced Officers Sir John Walsham has met with during his fifteen years connection with the Poor Law Department. In consequence of your application to the Board of Guardians for a Testimonial, I am directed to state that during the time you have been master of this Union Workhouse, now nearly three years, the Board of Guardians feel a pleasure in stating that they can testify to your active and industrious habits, the general kindness of your disposition, and to the great respectability of yourself and Mrs Barlow, indeed the Guardians feel called upon to state that your attainments will be found far superior to those ordinarily possessed by a Master of a Workhouse. The Guardians consider your notions of producing good order and discipline by kind treatment, well qualify you for the situation you are now seeking. The Guardians also desire to record the very -favourable opinion they entertain of Mrs. Barlow, who by her zeal, activity and good management, has done so much towards improving the condition and behaviour of the Female Inmates of the Workhouse, and I have no doubt the Guardians will be pleased to hear that you have obtained a better appointment than they are enabled to afford you, and to which you are certainly entitled.